Florida has the greatest assemblage of artesian springs in the world, with over 1,000 springs documented to-date. 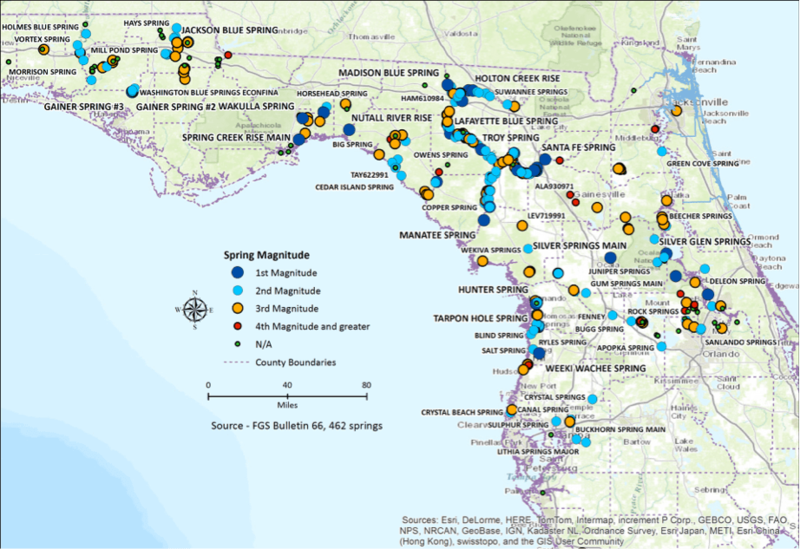 Florida also has the largest number of first-magnitude springs (33 counting river rises) with historic average flows exceeding about 65 million gallons per day, and the largest individual spring groups with flows over 500 million gallons of groundwater per day (Figure 1). The largest of these springs and spring groups are well known – Silver, Wakulla, Ichetucknee, Weeki Wachee, Homosassa, Rainbow, Crystal, Manatee, Blue, Wekiwa, etc. – and almost every Floridian remembers the first spring they visited and when that visit occurred. The importance of these springs may seem intangible. Yet, the value of springs can be measured, both in economic terms for water supply and recreational enjoyment, and in their environmental services that support water-dependent biotic communities. Healthy springs depend upon plentiful and pure groundwater. Florida has extensive laws that were intended to protect the quality and quantity of the state’s surface and groundwaters. While these laws provide a framework that, if fully enforced, could protect springs from further degradation, they have not been effective to-date from preventing significant impairment in spring flows and water quality. For this reason it is essential to elect state officials who will enforce and update laws intended to restore and protect Florida’s springs. During the past half century, declines in the health of our springs have become highly visible and well-publicized. Life-style changes are needed to reduce the human-induced impacts imposed on springs such as reduced flows and worsening water quality. Public education is also needed so decision-makers and the general public have a better understanding of “what we know” about Florida’s springs, both in terms of their normal functions and with regard to human-induced stresses that are changing them. Prudent and sustainable groundwater management is essential to protect the functions and values of springs into the foreseeable future. Here’s a brief overview of what we currently know about key environmental requirements that maintain our local springs; how changing environmental conditions are altering these springs; and recommendations for effective and cost-efficient solutions for restoring the health of our springs and aquifer, the foundation of a healthy economy. Figure 1. Florida’s springs heartland. The Florida Park Service estimates that in 2012-13, the 165 Florida state parks generated direct economic impacts of $1.2 billion and supported more than19,000 jobs. The 24 state parks that are centered on artesian springs had more than 3.1 million visitors, created an annual direct economic impact of about $127 million, and supported over 2,400 jobs during this same period. This recurring economic impact is equivalent to an endowed value over $4 billion and continues without expense to society. Water quality purification. For example, the Ichetucknee River continually receives groundwater contaminated with nitrate nitrogen from excess crop and landscape fertilization in the springshed. Natural biological processes in the spring run effectively assimilate about 350 tons of nitrate nitrogen each year. At an estimated cost of $50 per pound of nitrogen removal in conventional wastewater treatment systems, this natural purification function alone in a single spring group is worth more than $35 million each year. Clean and abundant groundwater is arguably the most important “natural resource” in Florida. The state pumps about 4.2 billion gallons each day from groundwater aquifers. If this inexpensive water supply becomes depleted or contaminated, the next most cost effective source is surface water from rivers and lakes at an estimated average cost to collect, treat, and supply of roughly twice as much as groundwater. If the inexpensive groundwater supply is exhausted or contaminated through saltwater intrusion, the next most viable option is desalinization of brackish groundwater or seawater at a cost of more than ten times that of our current groundwater resources. The majority of the rivers in North and Central Florida (e.g., the St. Johns, Hillsborough, Suwannee, both Withlacoochees, Wakulla/St. Marks, etc., Apalachicola are predominantly spring-fed during periods of low rainfall. These rivers and their dependent estuaries will lose their freshwater flows and forfeit their economic, biologic, and recreational values when their spring headwaters stop flowing or are polluted with excessive nutrients. Florida Spring Fact: There is no “threshold”- all human consumptive water uses in a springshed reduce spring flows. Florida’s springs are characterized by a high flow of transparent, artesian groundwater. Clearly, the pure, unpolluted ground water itself is the most important component of these springs. Nearly every aspect of a spring, from the basin size and shape, to the fish, other wildlife, and plants in the spring run, and the public uses of the spring, are dependent upon this flow of pure water. The number one objective of springs’ protection must be the protection of the quantity and quality of water in that spring. Every human use of water in a springshed – the area of land that recharges water to a spring – to some degree reduces the ground water flow to springs in that springshed. Every domestic, agricultural, commercial, and public water supply well, shallow or deep, large or small, uses some water that would otherwise discharge through the Floridan aquifer into artesian springs. When Florida’s human population was relatively low, the changes in flow in springs due to these human consumptive uses were often not detectable. This was true in light of the natural fluctuations that occur every year in the amount of rainfall that naturally recharges the aquifers that feed these springs. That apparent absence of a human effect on spring flow is no longer the case in much of Florida. It has been documented that most artesian springs in Florida are experiencing declining flows as a result of human groundwater uses. 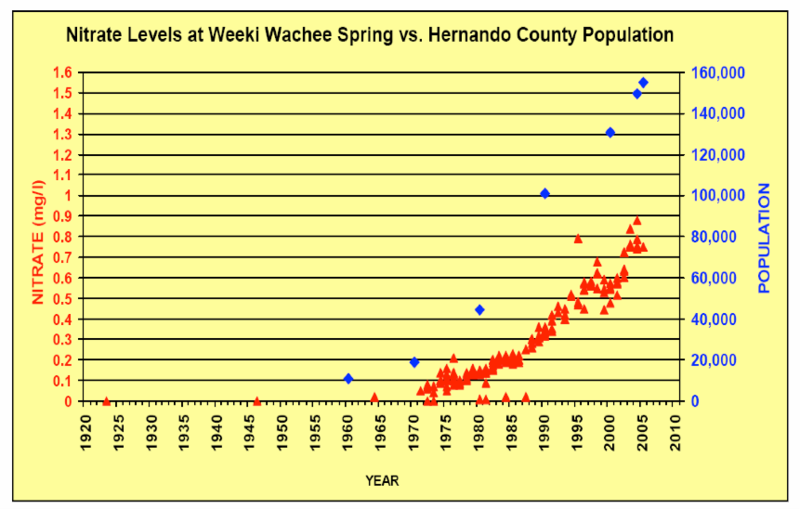 One documented example of a decline in spring discharge can be observed in the long-term data collected from Wekiwa and Rock springs (Orange County) near Orlando (Figure 2). 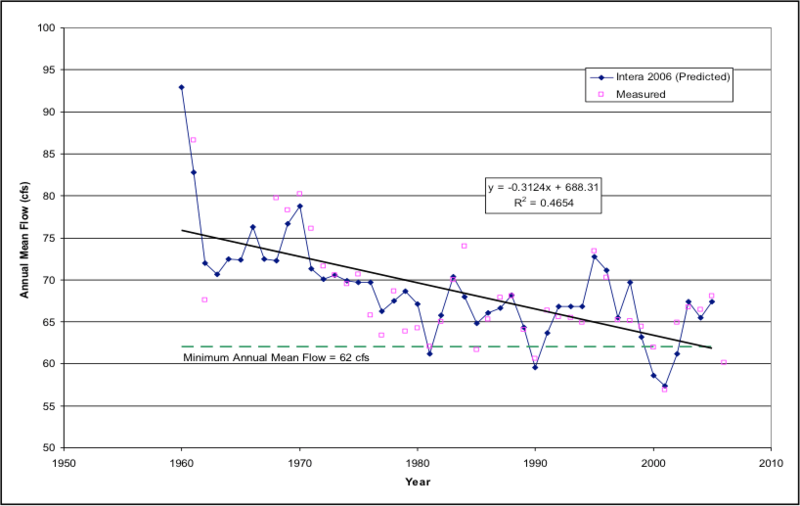 The magnitude of the contribution of human groundwater use on this multi-decadal decline in spring flows is even open to some question due to the natural variability in rain and resulting aquifer recharge. Unfortunately by the time flow reductions become obvious in springs, they are often so great that significant ecological values and functions have already been lost. Florida Spring Fact: The concentration of nitrate nitrogen, a recognized pollutant in surface and ground waters, is rising rapidly in response to agricultural and urban development. The increase in the human population in Florida and the corresponding land use changes resulting from that population increase are changing the quality of our artesian ground waters (Figure 3). An increase in nitrate nitrogen concentrations in the groundwater, almost state-wide, is one of the most shocking environmental consequences of the past half century of agricultural and urban development (Figure 4). While Florida has been known nationwide as a state with strict environmental protection standards, much of the state’s focus has been on protecting surface waters, with the tradeoff that pollutants such as nitrogen had to go somewhere else and often into the ground. This trade-off to protect surface waters from nitrogen contamination may have seemed like a good idea at one time, but it is now clear that the state’s regulations have not adequately protected ground water resources. Throughout the karst areas of north and central Florida where artesian springs are common, groundwater nitrate nitrogen concentrations have increased from a normal background of less than 0.05 parts per million (mg/L) to widespread concentrations over 1.0 parts per million (a fifty-fold increase),with localized hot spots greater than 10 parts per million – the USEPA drinking water standard for nitrate. These increases in groundwater nitrate concentrations are not only a threat to drinking water supplies for humans but are also polluting surface waters where high-nitrogen artesian water discharges from springs. Springs that evolved over tens of thousands of years with a nitrate concentration of less than 0.05 parts per million are now experiencing a 1,500 to 20,000 percent increase in the concentration of this macronutrient, accompanied by the loss of native submerged aquatic vegetation and the excessive growth of filamentous algae. Even if all human-controlled nitrogen pollution sources were stopped today, nitrate nitrogen pollution in the Floridan aquifer and in our springs will take years to decades to achieve historic concentrations. Figure 4. 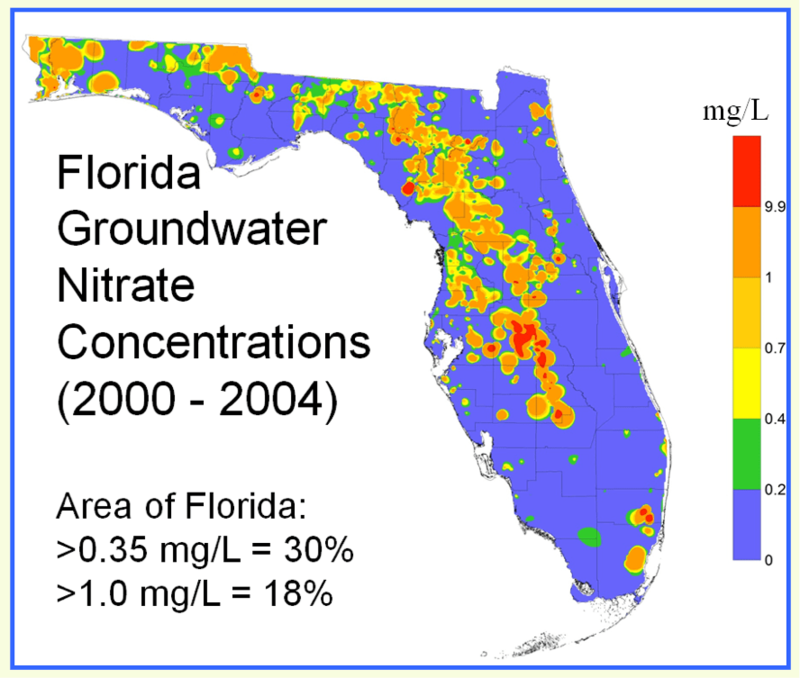 Nitrate-nitrogen contamination in Florida’s groundwater resources as measured in monitoring wells between 2000 and 2004 by state and federal agencies (prepared by Wetland Solutions, Inc.). Springs of Florida. Florida Geological Survey, Tallahassee, Florida. Wetland Solutions, Inc. (WSI). 2007. Human Use and Ecological Water Resource Values Assessments of Rock and Wekiwa Springs (Orange County, Florida) Minimum Flows and Levels. St. Johns River Water Management District Special Publication SJ2008-SP-2, Palatka, FL. 192 pp. Florida Springs Task Force 2006. Florida Springs – Strategies for Protection and Restoration. Prepared for the Florida Department of Environmental Protection.